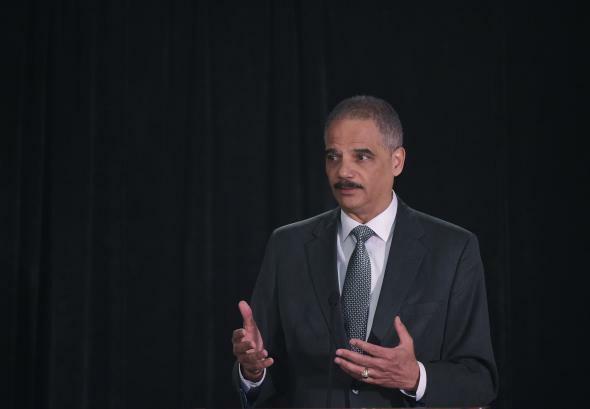 Eric Holder on racism in America: The attorney general speaks more directly than President Obama. Where Obama treads carefully, his attorney general is direct and unapologetic. When Attorney General Eric Holder speaks on race and racism, he doesn’t try to mollify the audience. Instead, he’s blunt. Comedy Central’s Key & Peele, a sketch comedy show from Keegan Michael Key and Jordan Peele, has a great recurring bit that debuted during the 2012 presidential election. In it, President Obama (played by Peele) responds to his more populist liberal critics with a new hire, Luther, his “anger translator” (played by Key). The parallel isn’t great—there’s no visible anger, for one—but I can’t help but think of this skit when I see Barack Obama, Attorney General Eric Holder, and their rhetoric on race and racism. Obama has said less on race than any other president, and when he does speak, he tends to aim for broad inclusivity. In his 2008 Philadelphia speech, given in the wake of the Jeremiah Wright controversy, he analogized the “anger within the black community” to the “resentments” in “segments of white community,” arguing against both as counterproductive, while urging listeners to recognize that they are “grounded in legitimate concerns.” Likewise, in his remarks on the George Zimmerman verdict last year, he challenged Americans to ask themselves about their own lives. “[A]m I wringing as much bias out of myself as I can? Am I judging people as much as I can based on not the color of their skin, but the content of their character?” he said. Legalized discrimination—where blacks were prevented, often through violence, from owning property, or loans were not granted to African-American business owners, or black homeowners could not access FHA mortgages, or blacks were excluded from unions, or the police force, or fire departments—meant that black families could not amass any meaningful wealth to bequeath to future generations. There are probably very few African-American men who haven’t had the experience of walking across the street and hearing the locks click on the doors of cars. That happens to me—at least before I was a senator. There are very few African-Americans who haven’t had the experience of getting on an elevator and a woman clutching her purse nervously and holding her breath until she had a chance to get off. That happens often. Where Obama floats an idea, Holder issues an indictment. Americans aren’t as tolerant as they imagine, he says, and they certainly don’t want to talk about it. What’s more, in Holder’s estimation, they’d rather focus on the cartoonish bigotry of a Donald Sterling than the deep inequities of our society. To be clear, this address wasn’t a barnstormer. But Holder speaks forcefully on institutional and systemic racism in a way we don’t normally hear from Obama but that compliments his rhetoric. As the Obama era ends, however, that might be changing. Last month, on the anniversary of the 1964 Civil Rights Act, Obama spoke to the National Action Network, where he attacked voter ID laws as unfair and discriminatory. “America did not stand up and did not march and did not sacrifice to gain the right to vote for themselves and for others only to see it denied to their kids and their grandchildren,” he said. And in an interview with David Remnick of The New Yorker, published in January, he was forthright about the role his race played in some of the opposition to his presidency. “There’s no doubt that there’s some folks who just really dislike me because they don’t like the idea of a black president,” he said. Soon, Obama will leave office and join the rarefied world of the post-presidency. With politics out of the way, and the new freedom that brings, there’s a chance he becomes his own “Luther” on race and racism, free to say what he thinks.